Home Defence Review India-Pakistan: A dialogue process or failed diplomacy? The on-and-off resumption of dialogue process has become more of a pattern between the strained India-Pakistan relations. The recent example being the brief meeting between the foreign secretaries of both countries, on the sidelines of the Heart of Asia conference on Afghanistan hosted by New Delhi, which failed to make progress on the stalled bilateral dialogue, post the Pathankot attack. …raises questions on why the two neighboursare unable to make any progress on the dialogue process and what are the factors that are largely stalling this process or failed diplomacy? Bilateral relations were furthered marred by the capture of an alleged Indian spy in the province of Balochistan and the debate on India’s involvement in provoking trouble in the region. With the recent developments in India-Pakistan relations, the question that arises is whether the Pakistani army is trying to play an upper hand by blocking the peace dialogue between the two nations. Pakistani envoy to India, Abdul Basit had earlier remarked that ‘the peace talks with India have been suspended’ and ruled out any chances of Indian investigation team visiting Pakistan post the return of the Pakistani Joint Investigation team’s visit from India in relation to the Pathankot military airbase attack in January. The attack had occurred just days after Indian Prime Minister Modi made a surprise visit to Pakistani Prime Minister Nawaz Sharif’s residence in Lahore and led to further postponement of foreign secretary-level talks between the two sides. However, the much anticipated foreign secretary talks on Tuesday did not yield any positive outcome, neither was the possibility of the India investigation team visiting Pakistan to probe the Pathankot attack discussed. This in itself reflects a grim picture of the India-Pakistan bilateral relations. Also, it raises questions on why the two neighboursare unable to make any progress on the dialogue process and what are the factors that are largely stalling this process or failed diplomacy? On the influence of the Military and the power it holds on the decision making of the country, the appointment of the next Army Chief in November this year shall be of grave importance and shall have a direct impact on the country’s foreign policy. Thus, the initiative did not last long and received a major blow when High Commissioner Abdul Basit referred to ‘suspension of talks’ directly affecting the Pathankot probe process. This highlights a series of hurdles within Pakistani leadership that pose a serious challenge to any possibility of normalization of relations in the near future between the two countries. One such reason for this could be the tussle for power between the Army- that yields a greater stronghold on matters of foreign policy and the Government headed by Prime Minister Nawaz Sharif. According to Dr. Ayesha Siddiqa, a Pakistani author and military expert, the leadership of Prime Minister Nawaz Sharif is fast deteriorating since 2013. The recent decision of allowing Former President Pervez Musharraf to leave the country has raised serious questions regarding his leadership role. Apart from this, the arrest of an alleged Indian spy Kulbhushan Jhadav by Pakistani authorities last month in the province of Balochistan has also contributed to escalation of strained relations between the two nations. On the influence of the Military and the power it holds on the decision making of the country, the appointment of the next Army Chief in November this year shall be of grave importance and shall have a direct impact on the country’s foreign policy. The appointment shall eventually lead to a power tussle between the military and the Government. PM Nawaz Sharif might have more leverage if the appointment goes in his favour. Apart from this, the United States has been playing a key role in supplying funds and weapons to Pakistan for its operation ‘Zarb-e-Azb’ which was initiated in 2014 to root out all anti-terrorist activities from Pakistani soil. In this context, the decision of U.S. sale of F 16 fighter jets to Pakistan on grounds of assisting in their anti-terrorist operations was received with grave skepticism as India launched a campaign in the U.S. Congress to block such a move. Pakistan is a member of the Quadrilateral Coordination Group (QCG), which also includes- United States, China and Afghanistan and is aware of its strategic relevance to counter terrorism in Afghanistan and to help initiate peace talks with the Taliban. It acknowledges and understands that in order to check Taliban and its activities it would be beneficial to engage with them by holding talks instead of fighting them as many countries such as the United States have by spending a huge amount of money and have been unsuccessful so far. However, with the recent setback in the Af-Pak relations post the deadly attack in Kabul on 19th April, India-Afghanistan ties could stand a chance of greater engagement as they share a long history of friendship. One such step in this direction could be by inviting India to be on board for the QCG talks. The Afghan President Ashraf Ghani in his recent address to the Parliament expressed his disappointment with Pakistan’s failure to lure the Afghan Taliban towards negotiation with the Afghan Government and their long term commitment towards peace and stability in the country. Thus, it seems like Afghanistan has made a major shift in its Pakistan policy. There has been a growing sense of skepticism and suspicion towards Pakistani interests and the fear that Pakistani involvement shall come attached with certain costs such as- the Durand Line, water dominance in the region, economic and political conditions etc. …the Kashmir issue seems to have become more of a matter of prestige for both nations, with neither party willing to back down. The Chinese on the other hand have been a strong ally of Pakistan and continue to do so. The growing partnership between China and Pakistan has been of major concern to India, particularly the latest Multi-billion dollar China-Pakistan Economic Corridor (CPEC) project which is a commercial venture but also holds major geographical significance. CPEC will start from Kashgar in China, pass through Pakistan and reach the Gwadar Port on the Arabian Sea. The project will cost about $46 billion, and the bulk of this expenditure will be on energy and infrastructure projects. [ii] This could help restructure the fragile economy of Pakistan and possibly provide a major competitive challenge for India. Pakistan actively supported China’s candidature for a permanent seat in the SAARC grouping in the last SAARC summit held in Kathmandu in 2014. However, fearing China’s growing influence in South Asia this move was not welcomed by India. Currently, China holds an observer status in the South Asian Association for Regional Cooperation (SAARC) and has shown keen interest in expanding economic partnerships within the South Asian region. It is important to take into account as to what China’s inclusion might bring to the table, will it strengthen the functioning of SAARC or lead to a political tussle on the issue of decision making between India and China-Pakistan in SAARC. Finally, it is crucial to mention the Kashmir issue continues to remain at the heart of all debates / discussions between the two countries. Pakistan insists on resolving the ‘K’ question as was again observed during the recent foreign secretary talks. However, for India it is a matter of domestic concern and does not seek any external interference. During the visit of British Foreign Secretary Philip Hammond to Islamabad in March, he urged both India and Pakistan to resume their long stalled peace talks and not allow non-state actors to disrupt the dialogue process. [iii] Hammond also pointed out that the resolution of Kashmir issue should not be a precondition to peace talks but instead both countries need to move ahead and focus on tackling other issues as well as engage for the betterment of bilateral relations. However, the Kashmir issue seems to have become more of a matter of prestige for both nations, with neither party willing to back down. Kashmir has been and shall remain a sensitive issue, crucial to the relationship that the two nations share. A resolution on that front seems like an impossible dream for now. Taking all these factors into account, it is evident that the general trend between the two countries has been limited to on-and-off discussions without achieving any feasible outcome or solution. Discussion is limited to talks which gets held up due to political differences, ceasefire violations, terrorist attacks etc. Meanwhile, both nations need to understand that regional cooperation is essential to assist Afghanistan in tackling terrorism and initiate peace talks with the Taliban, as it shall be in the larger interest of ensuring peace and prosperity in the South Asian region. In terms of bilateral cooperation, both nations stand a chance of gaining a great deal by engaging in the field of trade, investment etc. However, the political differences create a major hurdle particularly on the economic front. There is need to strengthen the visa system in order to implement more people to people contact by having cultural, educational and economic exchanges. The power tussle is blatantly evident in the working of SAARC and has hindered its decision making process for the overall regional and economic growth of the South Asian region. The trust deficit between both nations needs to be worked on not only by engaging in positive problem-solving discussions but also taking effective action towards it. Hence, there is no short term solution to the strained relations between the two countries and a large number of issues exist that can be tackled through a step-by-step approach by constant initiatives from both sides. 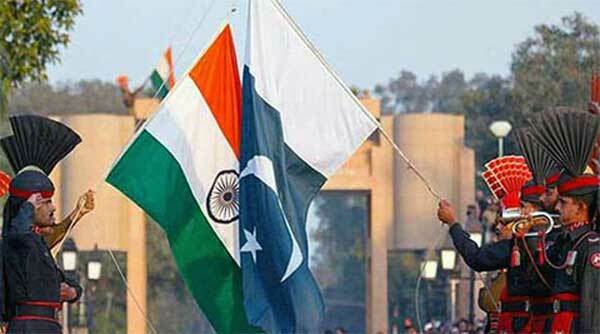 Dialogue is key to resolution of differences between the two nuclear giants in South Asia.